The magical country of Bolivia has rural villages and traditional communities in some of the remotest parts of the Andes. The mighty Incas, and their predecessors, were great road builders. There are therefore many stone paths linking these otherwise seemingly inaccessible areas. Winding through valleys and hugging hillsides, these routes offer fantastic trekking opportunities. You can visit far-flung communities, many of whom still live like their ancestors did in the past. Catch glimpses of a world that time forgot, free from the modern binds of most of today’s civilisations. You will also be able to gaze out upon dramatic landscapes, wild and craggy mountains, desolate barren lands, thick lush cloud forests and virgin glaciers. As most parts of Bolivia sit significantly higher than sea level, acclimatisation in the country is essential before starting, and whilst doing, any trek. Altitude refers to the distance from sea level. Altitude sickness occurs in some people when they are at high altitudes. There are no specific factors that correlate to the likelihood of altitude sickness. Higher fitness levels do not necessarily reduce the risks of altitude sickness. Altitude sickness occurs because of less oxygen entering the bloodstream at higher altitudes. Additionally, fluid can leak into the lungs and brain; this can cause serious problems and even death. It is vital therefore to properly acclimatise before going to higher altitudes. This means that you should spend some time at a particular altitude to allow your body to adequately adjust before pushing on. Do not try and go too high too soon. If you feel ill from the effects of altitude sickness, go lower. There are measures that can be taken, such as keeping well hydrated and taking preventative medicines. Good quality trekking gear can be obtained in La Paz. You will want your own well-worn in walking boots and thick socks, as well as appropriate clothing. Bear in mind that temperatures can alter quite drastically. A basic first aid kit should always be carried. Walking sticks are invaluable, and on some routes essential. Sleeping bags should be suitable for temperatures down to minus 10 degrees, as a minimum. High quality UV preventive sunglasses are recommended. High factor sun cream should be carried, as well as energy sweets and adequate water supplies. Ice picks and specialist equipment will be needed for some treks. The spectacular Choro Trek in Bolivia is often referred to as one of the best hikes in the world. Simultaneously challenging and fulfilling, this trek will take your breath away. Starting in La Cumbre, there are three main popular routes; to Coroico, to Chairo and to Yolosa. It takes in glacier-carved valleys, cloud forests, high passes, soaring mountains, subtropical forests, old Inca pathways, and an astounding array of flora and fauna. It is easy to access from the capital of La Paz and is also easy to do independently. With parts of the trail following ancient Inca trade routes, you really can walk in the footsteps of one of the world’s mighty civilisations. Altitude sickness is unlikely on this trek, because of the high start point followed by descending trails. The high start point also means that temperatures can dip dramatically, especially at night. The best time of year to do this trek is between May and September when the weather is drier. Allow a minimum of four days to complete the trek. 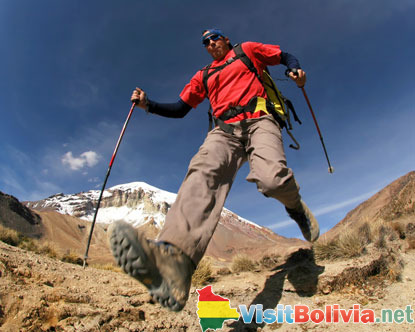 Many visitors to Boliva dream of conquering Sajamba Mountain. High altitudes and extremely adverse cold and windy weather can make this particularly treacherous. You will need a guide to attempt this climb. It will take around four days to complete this trek. Despite not being a technical climb, trekking in the lower areas instead is perhaps advisable for all but regular climbers and trekkers. There have been reports of attacks and thefts in the area though, so solo travel is strongly discouraged. This trek should be completed with experienced guides and will usually take around six days. It is best trekked between May and September. Elements are similar to on the Choro Trek; spectacular views of different landscapes. It is a lot more challenging, however, and parts can be very tricky and demanding. Accessible from La Paz, this is a fairly demanding trek that will require a guide to complete. Steep trails give way to breath-taking views. Another recommended climb is Huayna Potosi. Other treks include Laguna Glacier and the Trans Apolobamba Trek, where you will need a guide, and Takesi, which is possible to do independently. For guided treks there is a great choice of competitively priced agencies in La Paz who will help you with all your trekking needs. Whether you choose to do one of the independent treks or take a guided trek, you will be guaranteed some of the best experiences that the world offers.